--The toilet at Vantage (Frenchman Coulee) needs our help. There is a movement to build a second toilet at this heavily used climbing area. To learn more or to contribute, click here. --The Idaho Mountain Express is reporting that, "The Sun Valley Resort had 400,000 skier days this winter, an approximately 4 percent drop from the 419,000 it had in the winter of 2015-2016." To read more, click here. Rainbow Wall can be seen in the center of this photo. --So Alex Honnold soloed three major routes in Red Rock in a day. He started with the Original Route on Rainbow Wall (5.12b). Then drove over to Black Velvet and sent Prince of Darkness (5.10c), and then down-climbed Dream of Wild Turkeys (5.10a). To read more, click here. --The Huffingtonpost is reporting that, "San Francisco rescue workers made a dramatic save from the air of a man clinging to a steep cliff over the sea on Friday. The man, who officials said was homeless, hiked to a frightening height on a cliff near China Beach in the northern end of the city and apparently became paralyzed with fear. Surfers saw the hiker clinging to the sheer rock face and called 911, the San Francisco Chronicle reported." To read more, click here. --Vox is reporting that, "It’s no secret that oil and gas companies are on the hunt for new places to drill. But the quest for more fossil fuels could heat up in places you might not expect: our national parks.With President Donald Trump’s executive order on energy, federal agencies are now reviewing all rules that inhibit domestic energy production. And that includes regulations around drilling in national parks that, if overturned, could give oil and gas companies easier access to leases on federal lands they’ve long coveted." To read more, click here. --In New York City, there's a Girl Scout Troop for homeless girls. To read more, click here. --Killian Jornet is eyeing the Everest speed record. To read more, click here. --Outside is reporting that, "On Tuesday, the Outdoor Industry Association made a bold announcement: according to research done by the trade association, outdoor recreation now contributes $887 billion in direct consumer spending to the U.S. economy every year—$200 billion more than the industry’s initial estimate. The new report bumps up several other numbers, too, estimating that outdoor rec generates 7.6 million jobs (up from 6.1 million) and $120.2 billion in tax revenue (up from $79.6 billion)." To read more, click here. In seven and a half minutes, the video quickly demonstrates each of the techniques. And while they don't go into depth on any one technique, the do present a nice overview for those who are just starting out. Backclipping is one of the most common mistakes that beginning level leaders make. This is the process of misclipping a quickdraw so that the rope does not run smoothly out of the top of the carabiner, but instead runs behind the gate. If a leader falls with the rope clipped in such an orientation, it is possible that the rope could become unclipped. and how it may become unclipped in the event of a fall. Click on the photo for a larger image. This image from Greatoutdoors.com shows the proper way that a rope should be clipped. Note that the rope runs out of the top of the carabiner and over the spine. It is quite common for those that are learning -- and even some of those that have been climbing for a long time -- not to recognize a backclipped carabiner. 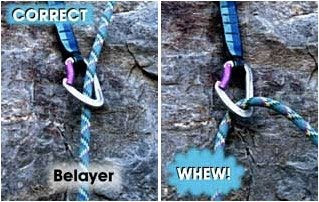 It is important for both leaders and belayers alike to be able to easily recognize an incorrectly clipped draw. It is also important to quickly correct this once it is recognized. One of the best ways to avoid backclipping is to practice the art of clipping a rope into a draw. Climbers should be able to do this with both hands, regardless of the direction of the gate. This is a great technique to practice while vegging in front of the television. If you can wire it at home, then your muscles will remember how to do it and will do it right. --Five climbers were killed over the weekend in British Columbia when a cornice collapsed. A sixth climber survived. The group fell over 1500-feet down the side of Mount Harvey. To read more, click here. --A 36-year old skier was killed in an avalanche at Red Mountain near Snoqualmie Pass this week. Morgan Miller was a guide and avalanche educator. He To read more, click here. --The Washington Post, as well as a number of other new sources, is reporting that, "Mary Anderson, a climbing enthusiast who helped start the outdoor retailer REI that has become the nation’s largest consumer-owned retail cooperative, died March 27. She was 107. Her death was confirmed by REI and reported by the Seattle Times. No other details were immediately available. 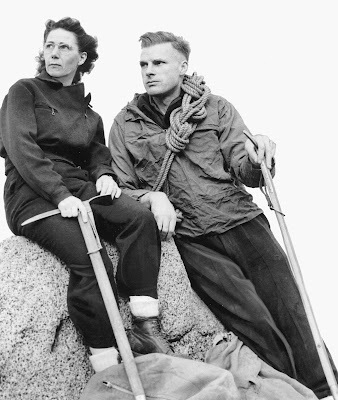 Mrs. Anderson and her husband, Lloyd, along with 21 mountaineering friends, started the consumer cooperative in 1938 out of a desire to find high-quality, affordable climbing gear in the United States. By forming a co-op, they were able to buy outdoor gear in bulk from Europe and other places." To read more, click here. Saturday, April 15 - Dallas Kloke Memorial Work Day at Mt Erie: Join in on trail work, trash clean-up and invasive species removal at one of the state's most scenic crags. Big thanks to Anacortes Park and Recreation, the Mt. Erie Climbing Committee, Solid Rock Climbers for Christ and American Alpine Institute or teaming up year after year! Click HERE for more info. 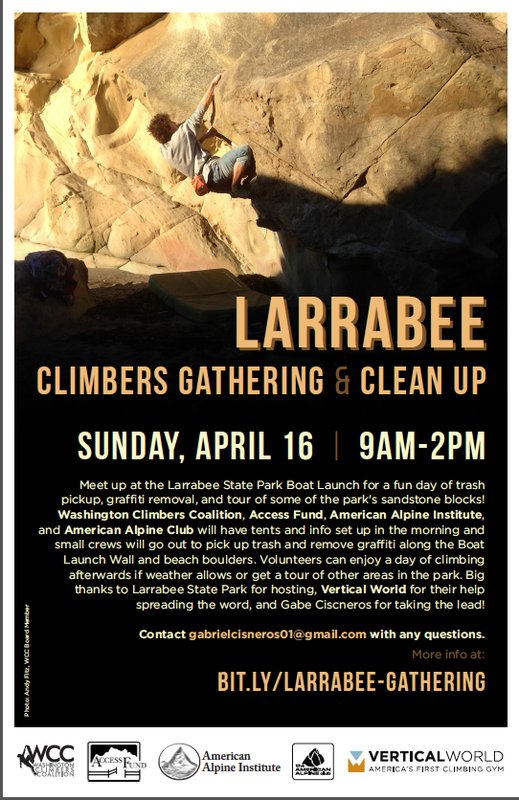 Sunday, April 16 - Larrabee Climber Gathering & Clean-up: Meet at the Larrabee State Park Boat Launch at 9:00am for a fun day of trach pick-up, graffiti removal, and tour some of park's sandstone blocks. WCC, American Alpine Institute and American Alpine Club will have tents and info set up in the morning with small crews going out to pick-up trash and remove graffiti along the Boat Launch Road and beach boulders. More details can be found HERE. 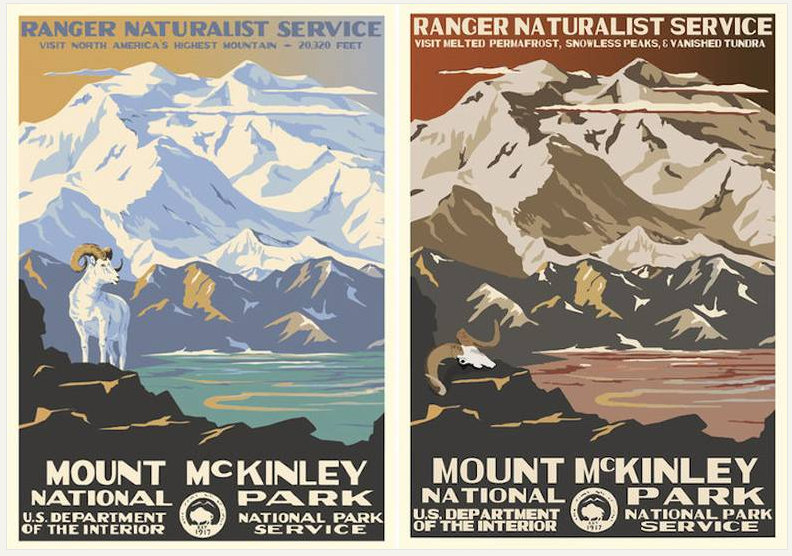 --As with other National Parks, the North Cascades has seen tremendous growth. The Seattle Times reports that, "There were 979,578 visitors to the North Cascades National Park Service Complex during the National Park Service’s 100th year." To read more, click here. --The American Alpine Institute will be working with the Liz Rocks campaign to provide a scholarship for our Leaders of Tomorrow program for youth who come from a diverse background or who face significant hardship. TheLeaders of Tomorrow program is the American Alpine Institute's premiere program for young people who wish to become climbers and mountaineers between the ages of 14 and 17. To learn more, click here. 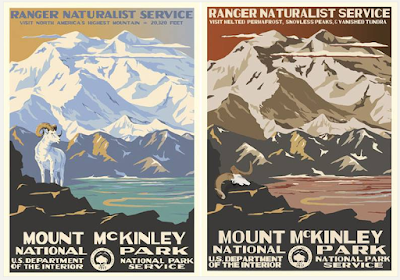 --Alpinist is reporting on the future of public lands. "April is likely to be a pivotal month for looming questions about the future of Bears Ears National Monument. 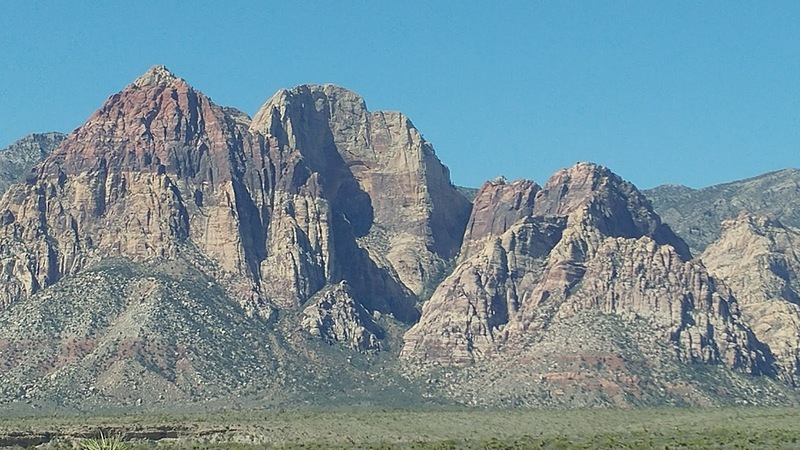 The monument includes world-class climbing areas such as Indian Creek, and its fate will be indicative of how national parks and monuments might fare in the future. For those who are in favor of the new monument, there is good news and bad news. Bears Ears, Grand Staircase-Escalante and other national monuments appear to be secure for the time being in spite of Utah lawmakers' efforts to have President Donald Trump rescind or reduce them—which is not to say rescission can't happen; only that the law currently protects these designations. An outpouring of letters and phone calls to government representatives appears to be making a difference as well, according to the Access Fund." To read more, click here. know it's worth" into the rock. 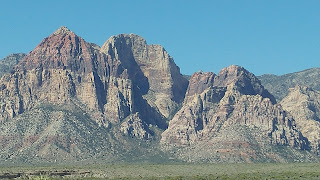 --Las Vegas 3 News is reporting on the ever-present battle against graffiti in Red Rock Canyon. To read more, click here. --News Channel 13 is reporting that, "A 31-year-old died while climbing Mt. Princeton on Monday. Matthew Wayne Lackey, 31, from Boulder, Colo. died from his injuries after falling around 40 feet and then tumbling an additional 100 feet down the side of Mt. Princeton." To read more, click here. --Westworld is reporting that, "Logan Goodwin, a twelve-year-old from Hermosa Beach, California, died from injuries sustained while skiing at Breckenridge resort on Saturday, April 8. He is the fifth skier to die at Breckenridge during the 2016-2017 ski season and the thirteenth person to perish at a Colorado ski resort during that span. The tragedy makes this season the deadliest in five years." To read more, click here. --The Associated Press is reporting that, "Federal authorities are looking at Vail Mountain's proposal to add 42 acres of skiable terrain for a training and competition area. The Vail Daily reports that the U.S. Forest Service held a public meeting on the proposal last week. About 60 people attended, most of them in favor of the proposal." To read more, click here. --And in other ski news, the Denver Post is reporting on the consequences of a new 1.5 billion dollar acquisition in the resort industry. "And suddenly Colorado is ground-zero for what will become the most hawkish rivalry in the U.S. ski resort industry, with Aspen Skiing – KSL vying against the world’s largest resort operator Vail Resorts in an escalating battle of consolidation. In the past year Vail Resorts has spent$1.1 billion for three-quarters of Canada’s Whistler Blackcomb ski area and $50 million for Vermont’s Stowe in an aggressive expansion plan anchored in a strategy to sell more of its wildly popular Epic Passes." To read more, click here. --There has been a recall on several Wild Country Friends. To read more, click here. --The Billings Gazette is reporting that, "Federal investigators say there is credible evidence of unwelcome conduct toward female workers in Yellowstone National Park. Alcohol, inappropriate contact and remarks that female employees said made them feel “uncomfortable and degraded” were revealed during a seven-month investigation into Yellowstone’s maintenance division. The report was issued Wednesday by Interior’s inspector general, who concluded that harassing workplace behavior by male employees had gone on for years because of actions or inactions of men in charge of the maintenance division." To read more, click here. --An 85-year-old man is vying to become the oldest man to ever climb Mt. Everest. To read more, click here. Bob Gaines, AAI Guide Jason Martin's co-author for Rock Climbing: The AMGA Single Pitch Manual, was Captain Kirk's double for the climbing scenes. The third use is when a character is forced to climb. This is an incredibly common thing in film. Movies that have scenes like this include North by Northwest, The Princess Bride, The Good Son, and Deliverance. Recently we saw this in Game of Thrones. We wanted to draw your attention to a great article from BBC that highlights a special woman. Last Friday, Ecuadorian Juliana Garcia became the first female mountain guide in Latin America to become fully IFMGA Certified. Juliana below the cerracs on Antisana. 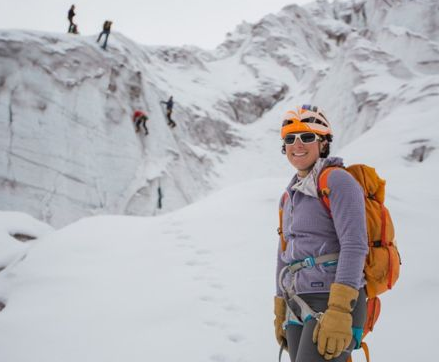 Roberto Espinosa F.
In the article, Juliana talks about some of the additional challenges that she encountered being a female in a predominantly male field, both from her peers and from the climbers that she was guiding. Click here to read the full article. Congratulations to Juliana and best of luck to you!